GirlsAndBeyond: Nail-Art... What do I need? Nail-Art... Don't we all love watching Nail-Art tutorials on YouTube? At least, I do. They seem so easy but when you try it yourself it's suddenly not as easy anymore and you may not have the right tools to accieve the same look as they have. I find myself not only struggling like this with Nail-Art, but also with Make-Up! It seems to easy but when I try it out I fail... That's not a reason to give up though. Nail-Art and Make-Up are my passion, I like doing it, so I will continue doing it! I've improved a lot during the years, and I'm still learning new things every day! The 2 Nail-Arts pictured above are the ones I did myself. 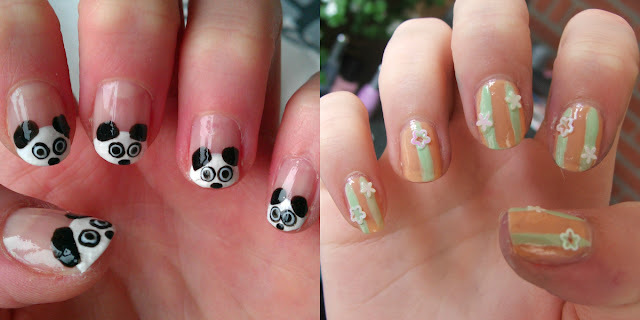 Click here for a tutorial on the panda nails, and here for a tutorial on the flower nails. All the stuff I think is important for nail art are the products pictured above. These are all products I've purchased myself, and you may have seen them somewhere on my website already! • The bottles at the back on the left side are striper nailpolishes, these nailpolishes usually come in small bottles like that and they have a long thin brush so you can easily create stripes and other patterns on your nails. secoat, but most brands do special top- and basecoats. • The smaller bottle next to the topcoat is my favorite nailglue (Broadway JetDry), I always use this for fake nails, and I even glued my finger onto my keyboard accidentally a while ago... really painful. in pots like that because they work way better, faster and cleaner than cotton pads. • The purple box is a stampy set, really good for stamping cute figures onto your nails. file is for smoothing out the surface of your nails, because bumpy nails don't good under Nail-Art. If you're not into Nail-Art you could also use some simple rhinestones or stickers. :) Those will glam up your nails as well! Do you like Nail-Art? If so, post some pics of stuff you made. I'd love to see! Love your nails! Well done! Thank you for your comment in my blog! Yes, let's follow each other! I'm following you now and then I'm waiting for you too! I like it! Lovely blog. What about following each other? Your nails are so gorgeous! Love them. Nail art is not really my thing but I love pictures of nail art. love the pandas sooo cute!! ♥♥♥ the panda nail art..super cute.. I think I got just that ;) hahah everything that is on your table i have too!